Tama Duffy Day is Principal and a Health and Wellness practice area leader at Gensler, the leading global design and architecture firm driven by research. A strategic leader with extensive experience in a diverse range of projects, she believes that research-driven design will transform environments into spaces that improve productivity and efficiency. With more than 30 years of experience she is a global leader in the creation of generative spaces, a research-based design method that makes both systemic and sustainable improvements in individual health, organizational effectiveness, and overall community well-being. 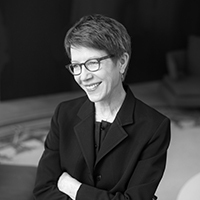 She also has been named several times as one of the � Most Influential People in Healthcare Design� by Healthcare Design magazine and is a member of the Women Business Leaders in Health Care (WBL).